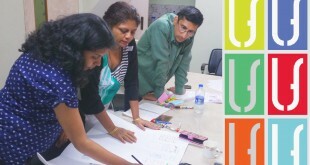 Event Management is looked upon as a sunrise industry in the service sector today. As per a report by EY-EEMA, the events industry (organized portion) in India is predicted to grow over 16% CAGR and cross Rs. 10,000 Crore mark by 2020-21. 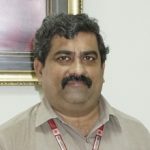 The functioning of the Industry is also getting extremely professional and organized with time. 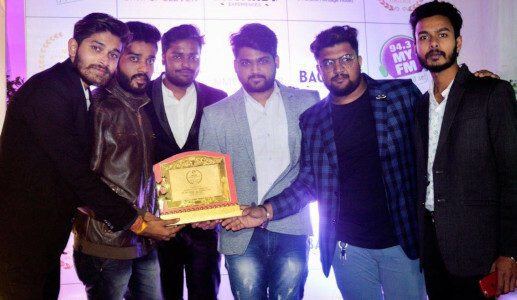 Meet the young vibrant team behind Narmada Events, the leading event management firm from Jabalpur, who are transforming their events into experience creation with amalgamation of technology, innovative ideas and creative content. Recipient of MyFM Entrepeneurs and Excellence award 2017, they not only make an event happen, they make it a happening one. 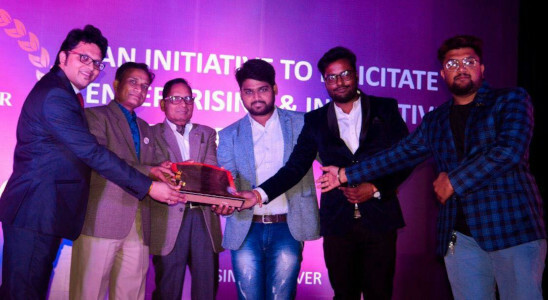 Team Narmada Events were felicitated with MYFM Entrepreneur and Excellence Awards, Jabalpur, in Dec ’17. 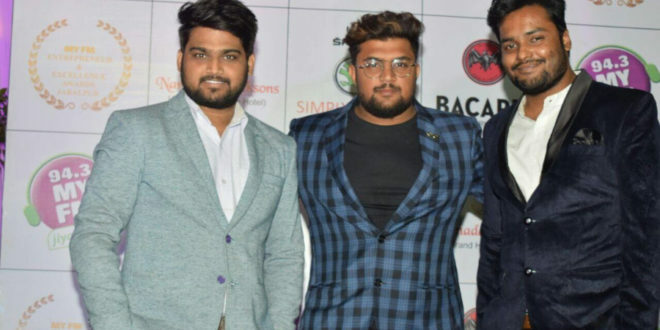 From Right – Vidit Soni, Abhishek Patel and Vipul Pandey of Team Narmada Events. 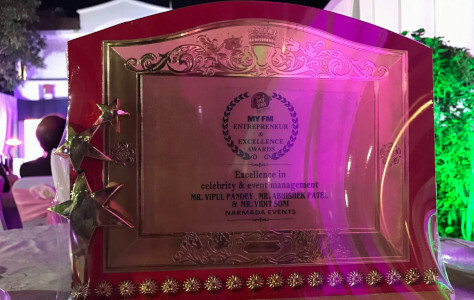 Team Narmada Events were felicitated with MYFM Entrepreneur and Excellence Awards, Jabalpur, in Dec ’17. 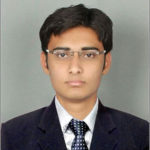 A brainchild of Vipul Pandey, Founder and Director, the seeds of Narmada Events were sown in 2012 when he was in the first year of his Electronics Engineering at Gyan Ganga Institute of Technology, Jabalpur. With the help of his college friends, he conceptualized a pocket friendly new year party aimed exclusively for students. They organized the party on 2 Jan 2013 instead of the usual 31 Dec night. With the premium rates no longer applicable, they got better deals from vendors and were also able to secure a good number of gift vouchers from local businesses. Buoyed by the success of his very first event, he decided to venture in this field. 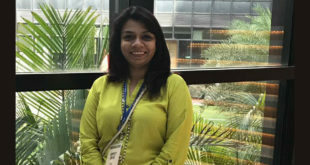 We realized that this field is unique as it offers a win-win arrangement for organizers, vendors and the attendees as well. 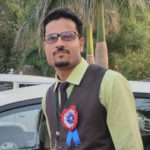 The seed was sown – The party organized by Vipul Pandey in 2013 to celebrate new year when he was in the first year of his engineering, that eventually set off the journey of Narmada Events. 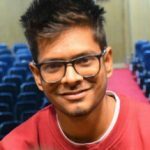 Gaining a different experience – Narmada events had organized a Dance workshop in 2013 with DID S03 finalist Abhik Banerjee in Jabalpur. Winning clients – Narmada Events planned and executed Garba fest for a local media house in 2013. 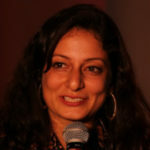 Tulika Ganguly, India Idol participant was the guest performer during the event. 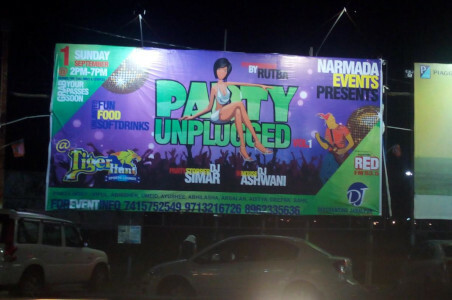 Innovation in entertainment ciruit – Narmada Events organized a DJ War in Jabalpur in 2014 with DJ Veronika from Mumbai as special guest. 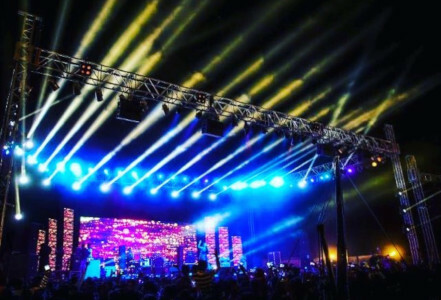 Being creative – Narmada Events conceptualized and managed a multi-day musical event for a popular multiplex in Jabalpur in 2014 with the aim to increase footfalls during its off-season. 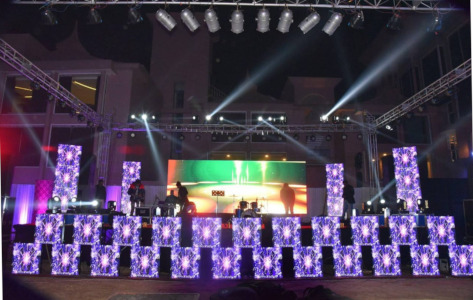 They built upon the fabulous start and organized varied nature of events like parties, DJ wars, dance workshops, cultural festivals like garba and stage shows in 2013 and 2014 getting rich exposure of various facets of event management. 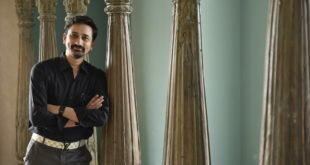 Vipul’s friends Abhishek Patel and Vidit Soni also joined him and Narmada Events took off. 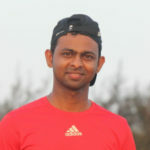 Many of their close friends like Sahil Patel have been helping them throughout their journey. They grew and leveraged their network and increasingly became better at design, planning and risk management, production, artist management and execution of events. 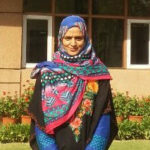 Working with agility and extreme sense of professionalism, they managed events whilst balancing their studies. In the initial years, we were a bit hesitant in approaching clients all out as we weren’t sure what sort of events we should be doing. We treaded the path cautiously. 2015 turned out to be a game changer for Narmada Events. Having built trust and a certain brand value of their own, they ventured into managing wedding events. Indian weddings definitely need lot of time and effort towards planning, implementation and attention to minute details but Team Narmada Events organized them to perfection. 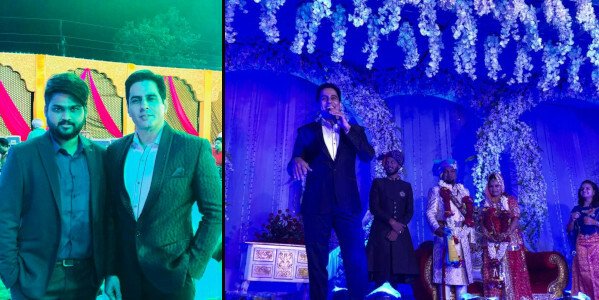 They got their biggest break towards the end of the year when they managed a big fat wedding of sorts which also involved managing over 15 performing artists, including some international artists, who came from Delhi, Mumbai and other cities. It was one of the best experiences! Not only the wedding was grand, we also had our share of anxious moments. Just the night before the wedding, unfortunately, our city’s airport runway got closed because of an accident. As a result, all the inbound flights of next day got cancelled. We had to get into crisis management mode to ensure all our performing artists reach on time for the event. It was a nail-biting finish! 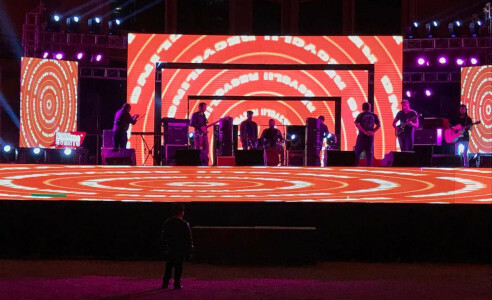 Narmada Events Jabalpur – Their expertise, agility, creativity and performance can be seen in the design and installation of stage, audio video equipment and event lighting. 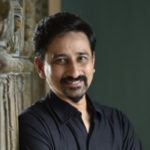 Team Narmada Events has the technical expertise to make the difference from conception to delivery. 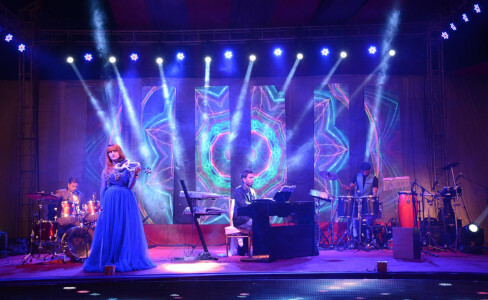 Narmada Events Jabalpur has created some of the most eye-catching event themes. They haven’t looked back ever since. 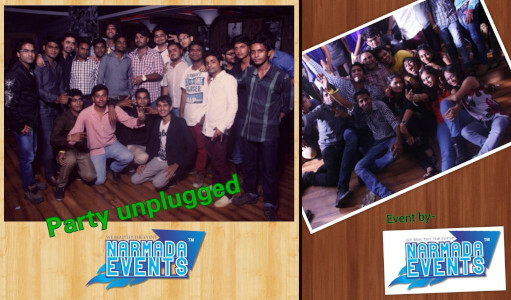 Team Narmada Events continues to set new benchmarks with each event in Jabalpur. 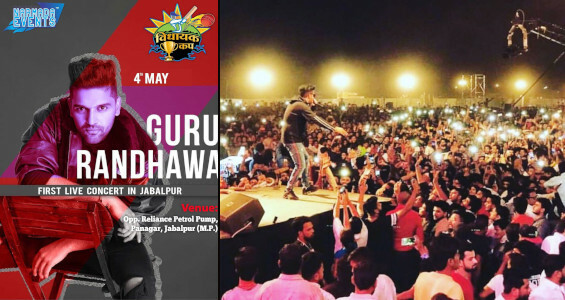 Be it organizing 4 out of the 6 premiere new year parties in town in 2017 to hosting bollywood celebrities like Himesh Reshammiya, Sunil Grover, Mugdha Godse, Krishna Abhishek, Kushal Tandon to bringing top performers like Guru Randhawa, Zakir Khan, Ami Mishra, Hardy Sandhu, Sunil Pal to Jabalpur, they boast of a repertoire of artists that only few can match in such a short period. 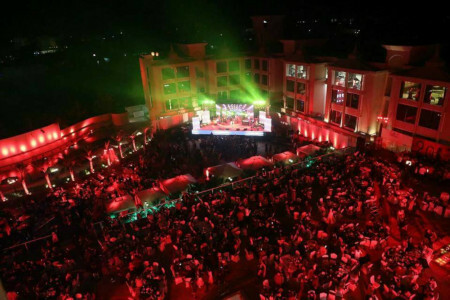 ♦ Introduced many renowned bollywood celebrities to Jabalpur for events. 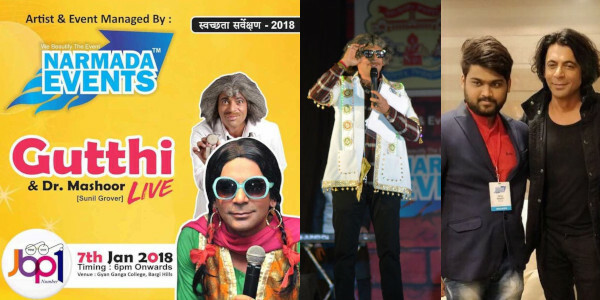 Celebrity Artist Management – Team Narmada events with famous bollywood actor Sunil Grover during his show in Jabalpur. 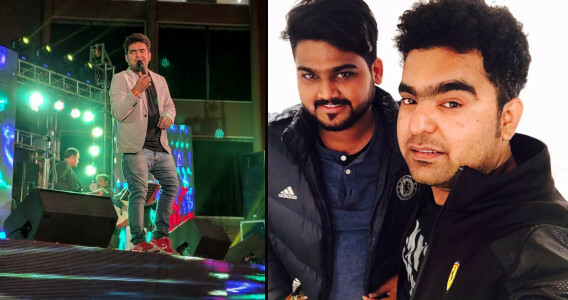 Celebrity Artist Management – Team Narmada events with famous standup artist Zakir Khan during his show in Jabalpur. 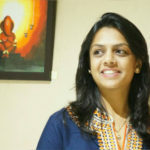 We used to frequently visit the Narmada ghat to brainstorm event ideas. We weren’t sure what should we name our venture and we said, ok let’s keep it as Narmada Events for now. It turned out to be lucky for us! 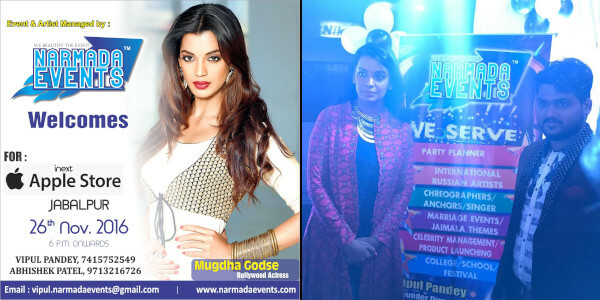 It was a moment of pride for Narmada Events when they received a VIP invite for one of the Marquee events of India – Finale of Femina Miss India 2018. 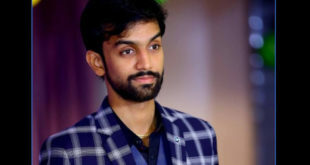 Vipul is seen here seated just in front of the judges and he was also lucky to get Miss India 2018 winner Anukreety Vas in his frame. Another moment of glory – Narmada Events was also invited for the prestigious Mirchi Music Awards 2018. 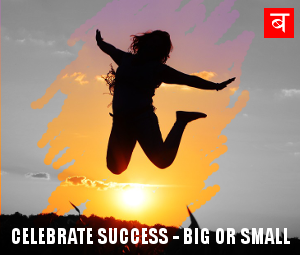 Vipul’s joy knew no bounds when he got to experience the event from the front row seats – a recognition of sorts for their hardwork in event management over the years. ♦ Rising number of rich and super-rich is creating a huge market for weddings, parties, etc. ♦ Government spending on events is estimated to increase at a growth rate of 14%. ♦ By 2020, more than 60% of India’s population will be below 35 years – a major plus for experiences industry. In the business of creating experiences, an event may be forgotten, but an experience will last a lifetime. 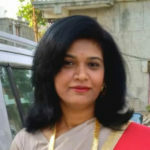 Narmada Events has evolved over the years and has grown considerably both in size and stature. They plan to expand and grow their operations across all of Madhya Pradesh. Their future only promises to be bigger, better and brighter.